After an Earth-scarring apocalyptic battle, humanity’s meta-heroes must take the fight to the enemy. Their task: hunt down the secret puppetmasters behind the Nazi robot invasion, the Thule Society, and cut off the multi-universe plague the Thulians have unleashed. It’s go time once again for the meta-heroes including fire-bender John Murdock, hacker-witch Vikki Nagy, healer Belladona Blue, super-quick Mercurye–and most of all for their ghostly ally, Seraphym, the spirit of the world who uses her secret influence to direct the fight against a Thulian-based tyranny of evil that is fast descending upon the entire universe! From New York Times best-seller and science fiction and fantasy mistress of adventure Mercedes Lackey together with a team of topnotch collaborators, the second entry in the blockbuster saga of superpowers–and the very human men and women who must learn to wield them. 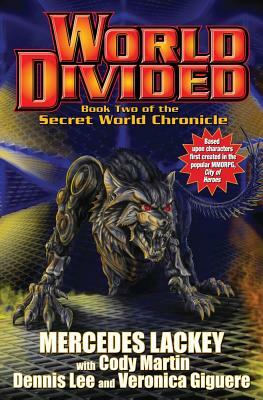 Veronica Giguere started off as the voice artist for the Secret World Chronicle podcasts then quickly proved her writing chops and was taken on as a series coauthor. Veronica remains active as a voice talent. An educator with a background in mathematics and ocean engineering, she has lent her voice to various research and campus promotional endeavors. She makes her home in Florida.